I’m actually kind of relieved that the Supreme Court ruled the way it did on the D.C. gun ban. If the decision had gone the other way, it would surely have thrown every rightwing gun nut into a state of hysteria and would probably have devolved into a huge, ugly issue during the fall campaign. Instead, guns will probably become a non-issue in the campaign now that the court has basically affirmed what most people already accepted - that the 2nd Amendment gives people the right to own a gun. That has never been an issue with me. Instead, it has been about how far out of whack some extremists try to push that “right” to the point where we have people walking the streets with sub-machine guns and cop-killer bullets. I don’t know anything about the D.C. crime situation, but I doubt that the gun ban was very effective in reducing crime and I don’t think that the court’s decision today will make much of a difference in that respect one way or another. Rather, it will take some of the pressure off of gun control advocates who never wanted a complete ban in the first place, and it takes some of the steam out of the extremist faction of the NRA which has used the specter of the government taking people’s guns away to fool them into voting against their social and economic interests. Exxon-Mobil’s political investments these past 18 years paid off in spades today as the Republican-dominated Supreme Court slashed the oil behemoth’s punitive damages from the 1989 Exxon Valdez oil spill by $2 billion. The Supreme Court on Wednesday reduced a $2.5 billion punitive damages award against energy giant Exxon for its role in an infamous 1989 maritime oil spill off the coast of Alaska. The high court concluded punitive damages should roughly match actual damages from the environmental disaster, which were about $507 million. Since 1990, Exxon has made nearly $10 million in political contributions with about 86 percent of that going to Republicans. That means a $10 million investment just got a $2 billion payoff today. That’s a pretty good ROI (return on investment). And that is not counting any of the other benefits that Exxon-Mobil has soaked up these past dozen years of Republican rule with their tax breaks and stratospheric gas prices. Thousands of animals died immediately; the best estimates include 250,000 to as many as 500,000 seabirds, at least 1,000 sea otters, approximately 12 river otters, 300 harbour seals, 250 bald eagles, and 22 orcas, as well as the destruction of billions of salmon and herring eggs. Charlie Black, a prominent McCain campaign advisor, recently acknowledged that a terrorist attack on the United States would benefit Republican efforts to hold onto the White House this fall. In a Fortune interview, posted on the magazine's Web site Monday, Black said the Arizona senator demonstrated his fluency in foreign policy and security matters following the assassination of former Pakistani Prime Minister Benazir Bhutto in December. Bhutto's killing was an "unfortunate event," he said, but McCain's "knowledge and ability to talk about it reemphasized that this is the guy who's ready to be commander-in-chief. And it helped us." Asked if McCain would stand to benefit from a terrorist attack on U.S. soil, Black answered, "Certainly it would be a big advantage to him." One has to wonder then, in light of this, as to the real reason why the Bush administration has failed so miserably at capturing Osama bin Laden. If, as Charlie Black says, it would boost Republicans’ electoral prospects to have another terrorist attack, or even the threat of a terrorist attack, then it would seem to be awfully convenient to still have the No. 1 international terrorist on the loose as the election is underway. It has been noted that “fighting terrorism” is the only remaining issue where polls show that Republicans still have an advantage over their Democratic adversaries. Do you think that might have raised some concerns high up in the administration that if bin Laden were to be captured and/or killed that it would become that more difficult to make “terrorism” a top concern for voters? Personally, I like to believe that the Bush administration isn’t really that twisted. It is much nicer to just continue believing that their failure to capture or kill bin Laden is due to their gross incompetence. Along with Steve Martin, Robin Williams and Richard Pryor, you can blame George Carlin for the evolution of my sense of humor. 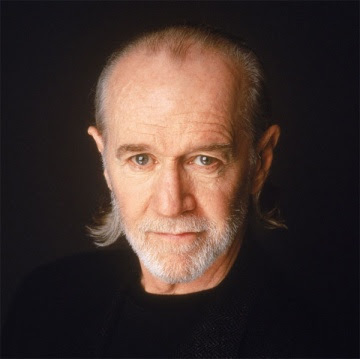 Even though I’ve never been a big fan of foul language, you couldn’t help but crack up when Carlin went through his expanded list of “the words you can’t say on TV” in one of his HBO comedy specials back in 1983-84. Those early 80s HBO specials are what I remember most about Carlin. I was too young to have appreciated his breakout in the early 70s, so I caught him during one of first revivals when I was in high school and college. I still have a cassette tape recording I made of one of his HBO specials using a handheld tape recorder held up to my TV. Funny stuff. He will be missed. Ann has a video from one of his most politically charged routines. Wingnuts beware!